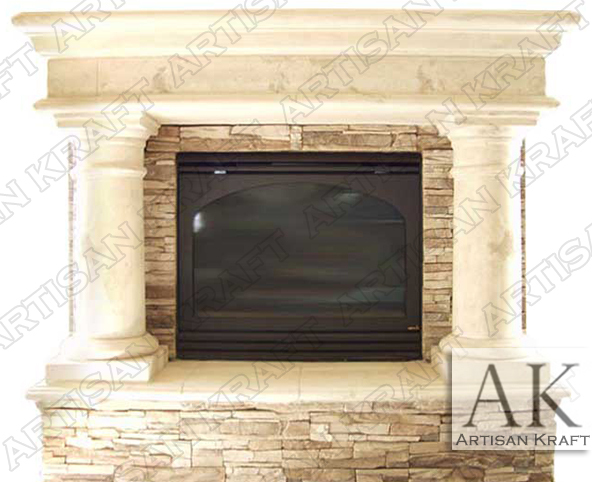 Rustic surround has two large Tuscan style columns supporting the mantel shelf. The large columns on this mantel make it a Texas sized fireplace. This can be purchase in our fireplace store showroom or here on the website. We are capable of providing all of our precast GFRC and marble items to Texas and other states as well. Cast stone is a fake/man made faux option. This faux option is light weight making the installation process easier. Glass covered gas firebox opening and cultured stone. Material: Limestone, sandstone, marble, travertine etc. Many different colors, textures and finishes.